We love that Cooper and Nicholas appear to enjoy the outdoors as much as their parents do. Today Cooper helped me tackle planting the garden. He wanted to dig one of the rows for the seeds. When the line was more curvy than straight, I took it as an opportunity for the perfectionist in me to let go a little knowing the seeds would be just as happy to grow in a not perfectly straight line. I then left Cooper in the garden while I pulled weeds nearby. I heard him talking about digging and making piles. This is when I realized he was moving shovels full of dirt/seeds all around the garden. We can only wait and see where plants will be popping up this year. 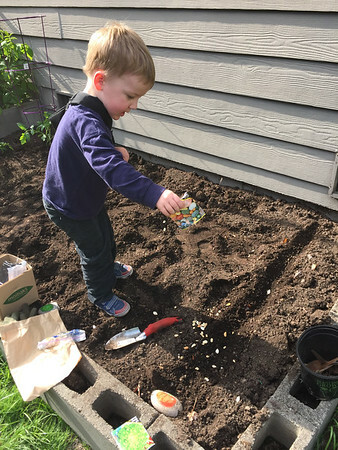 Planting with kiddos makes it more fun even if it means letting go a little too.